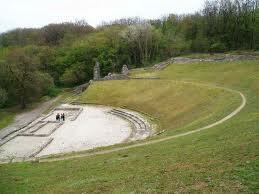 Perhaps you would like to take a bike ride to the local Roman amphitheatre? How about taking along a nice picnic? We have invested in a number of great bikes here at The Courtyard and you are welcome to use them whenever you want. Cycling is the national sport of France so drivers take extra care with cyclists and give you plenty of room so you can be sure of a great trip out even if you aren’t used to riding so much at home. The terrain here is fantastic for sightseeing by bike, there are absolutely loads of off road tracks or chemin blanc/ white roads named for the limestone gravel. These routes cut across beautiful countryside and more often than not through the vineyards. The big advantage is there is no traffic so it is completely safe for children who are learning. Our five year old son Finn loves to whizz up and down the lanes on his little bmx. This really is cycling heaven.